SyncMate syncs data on Mac with Android and iOS devices, Windows services (Outlook, Office 365 Business and Office 365 Home accounts), other Macs, Google, Dropbox and iCloud accounts, any mounted storage devices, MTP devices. SyncMate is offered in Free and Expert editions. 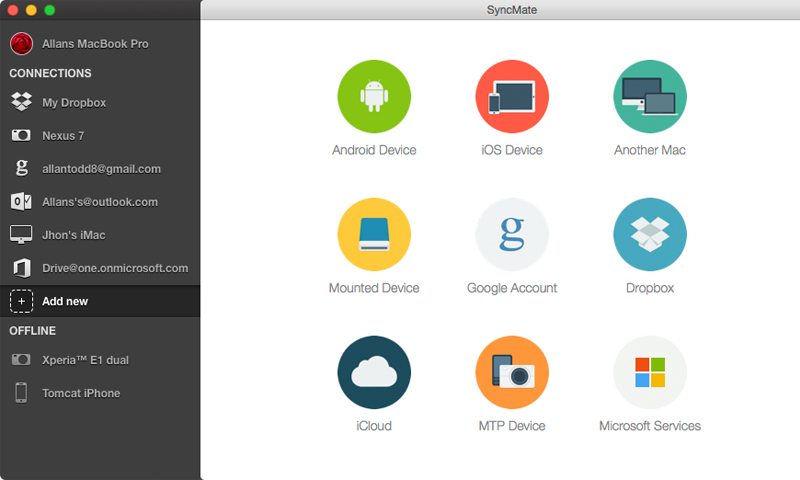 Free SyncMate lets you sync Contacts and Calendar between Mac and supported devices/ accounts. Free edition allows reading messages from Android and iOS right on Mac. Please contact us with the contact form to report difficulties, strange behaviors or persistent problems, and quote the program name or the number 19601 . This is the download page for SyncMate - SyncMate syncs data on Mac with Android and iOS devices, Windows services (Outlook, Office 365 Business and Office 365 Home accounts), other Macs, Google, Dropbox and iCloud accounts, any mounted storage devices, MTP devices.